This article is about the year 1886. 1886 (MDCCCLXXXVI) was a common year starting on Friday of the Gregorian calendar and a common year starting on Wednesday of the Julian calendar, the 1886th year of the Common Era (CE) and Anno Domini (AD) designations, the 886th year of the 2nd millennium, the 86th year of the 19th century, and the 7th year of the 1880s decade. As of the start of 1886, the Gregorian calendar was 12 days ahead of the Julian calendar, which remained in localized use until 1923. Wikimedia Commons has media related to 1886. January 29 –Karl Benz patent. January 1 – Upper Burma is formally annexed to British Burma, following its conquest in the Third Anglo-Burmese War of November 1885. January 5 – Robert Louis Stevenson's novella, The Strange Case of Dr Jekyll and Mr Hyde, is published. January 16 – A resolution is passed in the German Parliament to condemn the Prussian deportations, the politically motivated mass expulsion of ethnic Poles and Jews from Prussia, initiated by Otto von Bismarck. January 18 – Modern field hockey is born, with the formation of The Hockey Association in England. 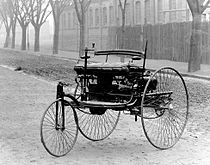 January 29 – Karl Benz patents the first successful gasoline-driven automobile, the Benz Patent-Motorwagen (built in 1885). February 14 – The first train load of oranges leaves Los Angeles, via the transcontinental railroad. March 8 – Anti-Chinese sentiments result in riots in Seattle, Washington. March 29 – Wilhelm Steinitz becomes the first recognized World Chess Champion. April 4 – William Ewart Gladstone introduces the First Irish Home Rule Bill in the Parliament of the United Kingdom; it is defeated on June 8. April 6 – The settlement of Vancouver, British Columbia is incorporated. April 25 – Easter occurs on the latest possible date (the next time is in 1943). A general strike begins in the United States, which escalates into the Haymarket Riot, and eventually wins the eight-hour day for workers. Emile Berliner starts work that leads to the invention of the gramophone. May 8 – American pharmacist Dr. John Pemberton invents a carbonated beverage that will be named Coca-Cola. Motherwell Football Club is founded in Scotland. May 29 – John Pemberton begins to advertise Coca-Cola (in The Atlanta Journal). June 2 – U.S. President Grover Cleveland marries Frances Folsom in the White House (Washington, D.C.), becoming the only President of the United States to wed in the executive mansion. She is 27 years his junior. June 3 – Uganda Martyrs: Charles Lwanga, 12 other Catholic boys and men, and 9 Anglicans, are burned (and another Catholic speared) to death, at the orders of Kabaka Mwanga II of Buganda in Namugongo. June 10 – The Mount Tarawera volcano erupts in New Zealand, resulting in the deaths of over 150 people, and the destruction of the famous Pink and White Terraces. June 12 – King Ludwig II of Bavaria is detained as part of a deposition, drowning the following day under mysterious circumstances. Six weeks later his unfinished Neuschwanstein Castle is opened to the public. June 13 – The Great Vancouver Fire devastates much of Vancouver, British Columbia. June 25 – Arturo Toscanini makes his conducting debut. June 30 – The Royal Holloway College for women is opened by Queen Victoria, near London, England. July 3 – Karl Benz officially unveils the Benz Patent Motorwagen. July 9 – American inventor Charles Hall files a patent for his process of turning aluminium oxide into molten aluminium (discovered on February 23). July 23 – Steve Brodie is reported to have staged a jump from the Brooklyn Bridge, a claim subsequently disputed. August 13 – Nagasaki Incident: Chinese troops riot during shore leave in Nagasaki, Japan. August 31 – The 7.0 Mw  Charleston earthquake affects southeastern South Carolina, with a maximum Mercalli intensity of X (Extreme); 60 people are killed, and damage is estimated at $5–6 million. September 1 – Grasshopper Club Zürich is founded as the first football club in the Swiss city of Zürich. September 4 – American Indian Wars: After almost 30 years of fighting, Apache leader Geronimo surrenders, with his last band of warriors, to General Nelson Miles, at Skeleton Canyon in Arizona. September 9 – The Berne Convention for the Protection of Literary and Artistic Works is signed. September 21 – American physicist William Stanley, Jr. patents the first practical alternating current transformer device, the induction coil. October 28 – In New York Harbor, U.S. President Grover Cleveland dedicates the Statue of Liberty, a gift from France. The ensuing spontaneous celebration in New York City leads to the first ticker tape parade. November – The extremely harsh winter of 1886–87 in the United States begins, killing tens of thousands of cattle on the Great Plains of North America. November 1 – The biggest Buddhist boys' school in Sri Lanka, Ananda College, is founded in Colombo. November 3 – In the British Raj, what will become one of the biggest boys' schools in Pakistan, Aitchison College, Lahore, is founded under the auspices of Sir Charles Umpherston Aitchison. November 11 – Heinrich Hertz verifies the existence of electromagnetic waves, at the University of Karlsruhe. November 14 – German inventor Friedrich Soennecken first develops the hole puncher, a type of office tool capable of punching small holes in paper. November 30 – The Folies Bergère stages its first revue in Paris. December 11 – London Association football club Arsenal, founded as Dial Square by workers at the Royal Arsenal in Woolwich, play their first match (on the Isle of Dogs). The club is renamed Royal Arsenal soon afterwards, supposedly on December 25. December 17 – English adventurer Thomas Stevens concludes the first circumnavigation by bicycle in Yokohama, having set out on his penny-farthing from San Francisco in 1884. Yorkshire Tea is established in Harrogate, UK. An inexpensive method for refining aluminum, the Hall–Héroult process, is discovered. Addis Ababa is founded in the Ethiopian Empire. Emily Ruete publishes her landmark memoir, Memoirs of an Arabian Princess: An Autobiography. Bedford Rugby Club is formed in England. ^ Soar, Phil; Tyler, Martin (2005). The Official Illustrated History of Arsenal. London: Hamlyn. p. 23. ISBN 978-0-600-61344-2. ^ "Memoirs of an Arabian Princess: An Autobiography". World Digital Library. 1888. Retrieved 2013-09-19.